Few days ago, a small city in the middle of Italy has honored the memory of fellow citizens that in 1943 rose up against the Nazis, during World War II. Similar celebrations take place annually in many other cities of the Peninsula, as the Nazi occupation following the Italian armistice claimed many lives of partigiani as well as unarmed civilians often killed in retaliation by former German allies. This year, the commemoration was made unique by the participation of a delegation of refugees, mainly of African origin. As the pictures shows, they have decided to march holding an overturned boat as allegory of the many vessels which have capsized on their perilous journey through the Mediterranean Sea, a route that has killed more than 3,000 migrants in 2015 and more than 3,400 in the previous year. The event per se may not be of particular relevance, as the delegation was composed of some 30 individuals in a region with an overall population of 1.3 million, where less than 1,000 refugees are currently host. However, even such micro-reality can open a window on general considerations in relation to the contextual circumstances of migration to Europe. In particular, my interest was caught by the several, and overall dominant negative comments appeared on the Facebook pages of local media outlets which were not just challenging the presence of refugees at the commemoration, but were actually questioning their status of refugees in the first place. I do not intend here to enter into the merits of FB user’s contentions, characterized for much part by consistent generalizations and illogicalities (for example, a top “liked” post suggested that a ‘true’ refugee should fight for freedom in his/her own country. But isn’t fleeing or being outside the homeland a crucial part of the definition of “refugee” itself? Yes it this, according to the 1951 Refugee Convention. And this accounts only for the semantic level. Nor need I here to recall the role of African (colonial) troops in both World Wars or again to stress the legitimacy of carrying a symbolic boat in the streets of Europe, given current circumstances. To be sure – this episode can throw a light on the broader process of (non-) incorporation of migrants into the memory of single national histories and even into the European Union’s narrative. It is from this failed incorporation, I argue, that such comments may originate and receive some degrees of approval. There are at least two overlapping processes to take into consideration: firstly, modern European societies have been imagined, invented, educated on assumed national/ethnic homogeneity: a normative tendency which accounts for the marginalization of national citizens’ migration history in primis. Neglecting and marginalizing past migrations create the illusion that the citizens ‘have always been there’ and for some this suffices for legitimizing the unwelcoming attitudes displayed towards those individuals with a migration story on their shoulders. The commemoration is a case in point. Yet the commemoration is echoed also in the second process that I wish to mention: it deals with the specific and more deliberate resistance to the incorporation of migrants’ memory due to political reasons. We know from studies on nation and nationalism how central are public ceremonies and monuments for the development of a national consciousness. We have also learnt about the European Union’s effort to proclaim a narrative for the entire continent through the recourse to the notion of Europe as a civilization, whose development was made possible by all member countries, with the scope of transferring the aforementioned national consciousness at the Community level: the ‘infiltration’ of new sources in these processes is seen as a menace to that very idea of civilization and would force institutions to deal with identity issues for which, under many aspects, they are not ready yet. Caught between a rock and a hard place, namely between the myths of homogeneity and European integration, non-European memories undergo a double process of marginalization as these two are functional to exclude the “Others” from the “We, Us” represented by national or European citizens. And this happens against the fact that Europe and Africa have been deeply connected one with the other politically, socially and economically since colonialism, to mention only modern history. An entire history of fruitful as well as detrimental encounters exist thus for the two continents but it is opportunistically overlooked. There are several examples clarifying how this resistance occurs when considering monuments and commemorations: one example is the Marcus-Omofuma-Stone, placed in Vienna in remembrance of the Nigerian asylum seeker killed in 1999 by three policemen’s negligent manners. Positioned without the authorities’ approval in 2003, the stone was first removed and then replaced and has continuously been target of vandalism, including xenophobic graffiti. Another example is the Museum of Migrations established in Lampedusa without the contribution of institutions. Even the installation in 2008 of the memorial named “Gateway to Lampedusa – Gateway to Europe” on the island was made possible by a non-state initiative; however, one wonders what is the impact of such monuments, since they are located at the centre of globalized dynamics yet only at the ‘periphery’ – whether real or artificial – of Italy and Europe. 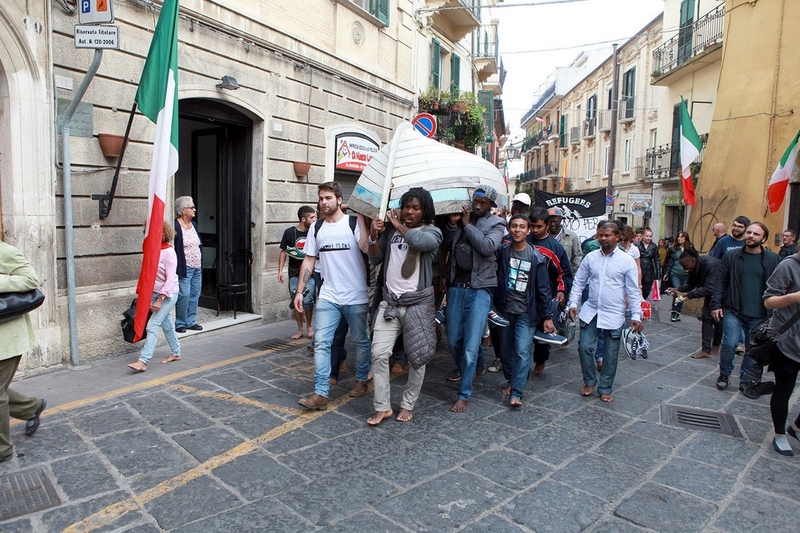 Even the state funeral for the 368 victims of the 3 October 2013 shipwreck was initially delayed by authorities and then celebrated in the absence of the coffins which had been already sent to Sicily notwithstanding the protest of the survivors. One more example: the Comitato 3 ottobre (3 October Committee), composed of a mix of civil society, NGOs and municipalities launched an initiative aimed at establishing in Italy an official memorial day by state law for all the victims of migration: while the proposal received the approval of the lower house of the Parliament in April 2015, at today the Senate of the Republic has delayed the procedure and the recurrence of the second anniversary of the deadly shipwreck was commemorated, once again, without an official institutional contribution. Despite that, spontaneous manifestation of solidarity took place in several cities, demonstrating once more the commitment to remember beyond the state. Through all these acts of resistance, there are few elements of changes that are worth noting: honoring the memory of those died attempting the cross-Mediterranean journey – and other routes, is not anymore a taboo for state institutions and governments. Although in the absence of official state support, institutional representatives are now participating more frequently to memorial services as recently seen in Malta and Lampedusa. These developments have specific political implications to be explored, yet they seem to have become possible thanks to the primary effort of both the civil society in all its organizational forms and of the migrants themselves. Perhaps this is the beginning of a bottom-up process of inclusion of migrant’s memories.